The “Science Bridge: Asia” program of the Robert Bosch Stiftung supports scientists working in Germany who would like to strengthen and rekindle exchange and cooperation with researchers in China, Indonesia, India, Japan, Singapore, South Korea or Vietnam. The aim is to give uncomplicated support to scientists wishing to work together on new research projects. This will allow a dense professional network to emerge, facilitating the exchange of experience and information between scientists in Germany and Asia. It is hoped that significantly more researchers from Germany will gain firsthand knowledge of the rapidly developing Asian research sector; while Asian scientists will get a first taste of the German research environment. In our initiation project, the research group of KIT and Tsinghua University will start their research collaboration with the focus on theoretical research as well as engineering efforts within the urban sensing network and application tools. As a concrete research topic, this project will investigate the correlation between energy consuming systems (transportation, buildings, street lighting, etc. ), the energy consumption of the city, and conditions of the natural environment, e.g. air quality. 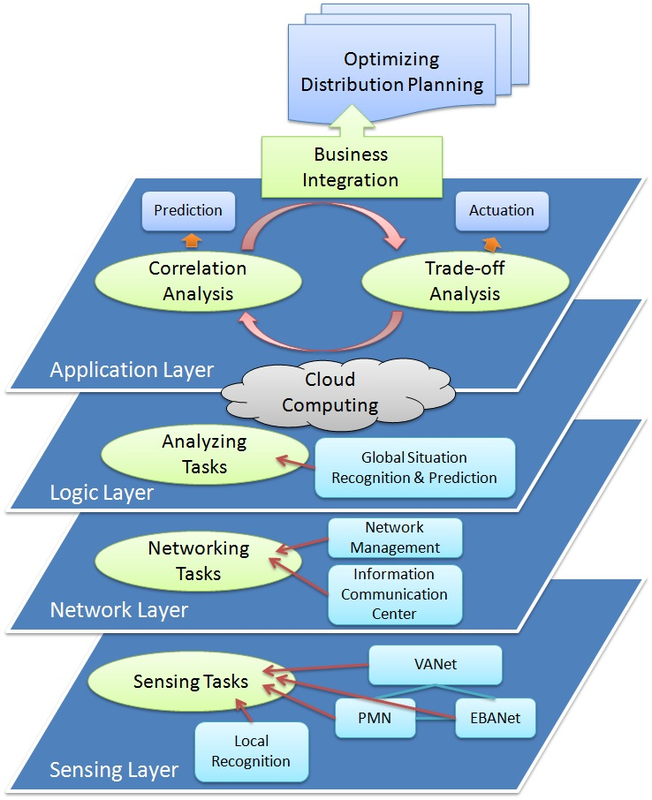 The research will follow a practical approach to build up the required database and to evaluate our research: We plan to use Internet of Things (IoT) and wireless sensor technologies for collecting required information about systems and environment, and we will design and build a distributed system for recognition and correlation analysis. Implementation of the sensor system will be based on a taxi-based VANet (vehicular ad hoc network), a low-cost and efficient approach for urban sensing using IoT information collection methods to capture various environmental parameters (air quality, noise pollution, traffic levels, water quality, etc.) in a distributed manner in real time. These data are fed into a recognition and correlation system. By applying correlation analysis techniques to these data, global machine learning approaches will be trained to recognize important city events and dynamics which will affect electrical power consumption and create anomolies in pollution levels in specific locations such as sporting events, rallies and fairs. The event-driven situational information could then indicate a predictive relationship with electrical energy consumption information. This information can be integrated into the business processes of utility companies to greatly improve their power consumption prediction methods, thereby significantly reducing the cost of electricity for all consumers.